This course covers basic stone and tile identification, chemical selection, and hand tool usage, as well as portable high-pressure units and truck-mount units. You will receive extensive hands-on Color Sealing training. 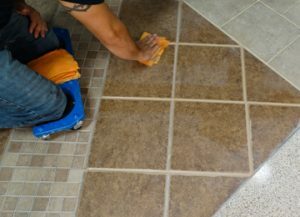 Our training facility has 2000 square feet of tile with 10 different types of floors, so you will get to experiment and learn how to work with the same types of floors and surfaces as jobs in the field. I liked how much hands-on work I had. I also enjoyed how after every discussion in the classroom, I got to go to the training room and utilize the machines and chemicals to do the process myself. John, Butch. Doug & Debbie were AMAZING instructors. They made my experience one I will never forget! John Freitag and his team at the stone and tile school are serious about your training. Each individual has their own floor machine during their class. This is important for someone with no experience in marble restoration. It’s easier for the instructor to observe and see where you may need guidance. John and Butch are very knowledgeable. They are willing to teach you how to succeed in the marble maintenance and restoration industry.With their knowledge and the ability to pass it on to you in a understanding way means you will succeed after attending their school. Thank you.